Ah my first negative savings rate month of the year! It was a perfect storm of an unexpected home repair turned remodel, vacations and other purchases. To say my summer was (and still is) busy is an understatement. Half of the spending is the mortgage and extra principal payment. The kids bathroom toilet seal broke as the flange is warped and the bolt popped out. Over time this caused subfloor damage. I tore it up and ended up deciding to remodel the whole bathroom myself. It has been great learning to do ceramic tile. To try to cut my utilities I am also upgrading to an ultra-efficient Niagra .8 GPF toilet. I installed one downstairs and the flush is powerful and and gets the job done. It is good for the environment and saves me money. Besides that we have been busy painting 2 bedrooms and general house maintenance. The kids tend to break things faster than I can fix them. Bike ride anyone? I now have a bike and picked one up for my wife so we could go on kid free romantic bike rides together in the evening. Over budget (again). I didn't budget in my travel expenses my wife's sweet tooth. I will account for that next year. This tooth resulted in stocking up on fudge (now frozen) for eating during the long winter months. Chiro bills keep rolling in from my previous (crappy) insurance. Paid those off and now going forward it is only a $30 copay. I can't say enough how great it feels to not have pain and muscle cramps anymore. Why did I wait so long to see a doctor? Still ridiculously high. Hoping once I get all my toilets replaced we will see it go down. Plus our summer has been unusually cool and have only turned the AC on a few times so far. My contract with DirectTV is up so I plan on dropping that $100/mo. bad habit. Just have to convince the family less is more. My new employer won't pay my cell phone so that is now back in my expenses. They do offer a discount so come November when my son's phone is out of contract we will switch. 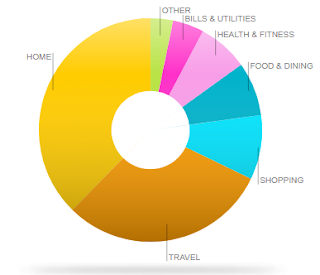 My gas usage has dropped so much since working closer to home that it no longer has its own category on the pie chart. Plus, knock on wood, no repairs for the cars yet this year. The only other thing worth mentioning is my old Employer's HSA is now collecting a fee of $4 a month to manage it. The money is just sitting their invested so I am not sure what they are managing. Fees are an unpleasant feeling. Can move it like we do with a 401k to an IRA? Well here it is, -36% Savings rate for July. Brings my average for the year down to 33% of net income saved. If we were to take vacation out of the picture my savings rate for the month is 5%. The expense was paid from savings so I still maxed out my 401k contributions. I leave the month with mixed feelings. Vacations with the family are great but I also don't like seeing my savings go down. I am now looking at my Wet Worth (Dividend Life) to get a better picture of where I stand in my FIRE quest. 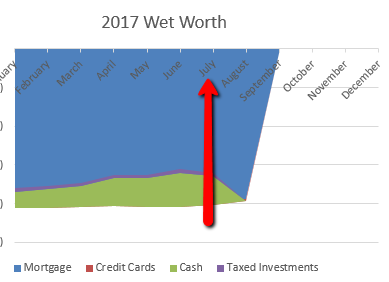 Seeing that worth improve all year and then drop in July reminds me that there is a trade off between enjoying life now (vacation) and working towards freedom. I do enjoy travel and seeing the natural and man made wonders of the world. Would I have been just as happy doing local stuff with the family? Your thoughts are welcome. Don't let a temporary setback get you down. It's a marathon not a sprint. I can tell you from experience FIRE is worth the sacrifices. I wouldn't worry to much about the down month. Part of this journey is learning and adjusting. And hopefully improving over time! Yep I know it is just one month. Was hoping though to have positive savings all twelve months. Oh well, the long term is what counts. I looked at getting the Niagara toilet when I was looking around last year for a replacement. I ended up with an efficient model from the local plumber instead, but I'm glad that's working out and saving your money. Our water rates went up this year too - apparently nobody has told our City that inflation is < 2%. Based on the IRS, you can rollover HSA accounts once per calendar year so you perhaps start an HSA at another bank. They may charge fees too though. There's some detail about rollovers at https://www.irs.gov/publications/p969/ar02.html#en_US_2016_publink1000204081. Just wanted to echo the above comments and say that it's awesome how you're tracking your expenses and keeping on top of them. I had a down month too in August. Like with the bathroom repairs, some of the work done doesn't have visible results but it's there just the same, helping you out in the future. Thanks for the info DL. Yeah I don't know where they get inflation is that low. I guess all the stuff most people buy (consumers) we don't buy. That stuff lowers in price and utilities go up.